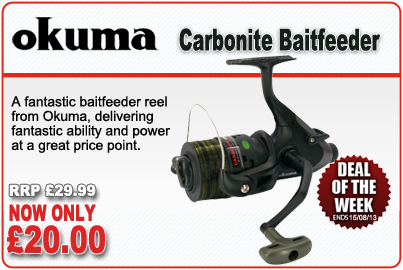 Deal of the Week is the Okuma Carbonite Baitfeeder Reel with an RRP of £29.99, now only £20.00!! The Okuma Carbonite Baitfeeder CBF Reel features a graphite spool with pre-spooled nylon camo line, Precision Elliptical Gearing, graphite spare spool, computer balanced rotor system and water tight drag seal that gives the angler fantastic ability and power at a great price point. Use this reel for a number of fishing situations including: Specialist and Predator fishing.